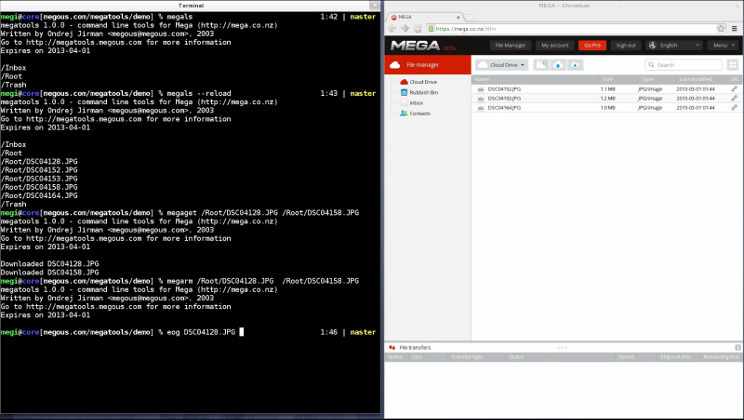 Megatools is a collection of programs for accessing Mega.nz service from a command line of your desktop or server. Megatools allow you to copy individual files as well as entire directory trees to and from the cloud. You can also perform streaming downloads for example to preview videos and audio files, without needing to download the entire file. You can register account using a 'megareg' tool, with the benefit of having true control of your encryption keys. Megatools are robust and optimized for fast operation - as fast as Mega servers allow. Memory requirements and CPU utilization are kept at minimum. Megatools are reasonably simple and cleanly written. You can skim the entire code in an afternoon and see what it does. You can be completely in control of the update process for megatools. Pace of development is slow and changes are easy to review. This is all important if you value your security, as shown by issues with browser based solutions (mega.nz browser extension hacked). Megatools was written to avoid such issues. Mega website can be found at mega.nz. Read this issue if you've registered an account via mega.nz web client since 11/6/2018. You'll not be able to use your account with megatools. You can still use megatools to download publicly exported files for free, or use accounts created before 11/6/2018. Megatools is Free and opesource software. It is an independent personal project not backed by any comapny or commercial interests. If you benefit from megatools or would like to see it improve and grow, you can contribute by writing code. Keep yourself in the loop about new releases and features via RSS. See the NEWS file for detailed description of changes. New megatools experimental builds are available, added support for IPv6 and source IP address/network interface selection. New megatools experimental builds are available, added test and export tools. New megatools experimental builds for macOS, contributed by a user. New megatools experimental builds are available. Megatools 1.11.x has experimental builds now include a few new architectures: MIPS little-endian, i686, and a special build with Windows XP support. Megatools 1.11.x development branch now features regular experimental releases with pre-built static binaries for Windows and Linux. Check it out in the Download section below. Megatools 1.10.2 released with a hotfix for mega.nz api quirk. Megatools 1.10.1 released with some fixes and a file chooser for folder downloads. Megatools 1.10.0 released with some fixes for upload. Megatools 1.10.0-rc2 release candidate released with some fixes for upload. Megatools 1.10.0-rc1 release candidate released with major optimizations and new features: multi-connection upload, interrupted download resumption, and maxing out a gigabit LAN on a cheap VPS is now possible. Megatools 1.9.98 released with bugfixes and some new features. Megatools 1.9.97 released with bugfixes. Megatools 1.9.96 released with bugfixes. Megatools 1.9.95 released with bugfixes. Megatools 1.9.94 released with bugfixes. Megatools 1.9.93 released with bugfixes. Megatools 1.9.92 released with many bugfixes, solved annoying server busy errors, and windows package updates (new 64bit package!). Megatools 1.9.91 released with bugfixes and all new man pages. Megatools now support shared folders, downloading exported folders, video/image thumbanils, and contacts management! Megatools now play well with major linux distros, Ubuntu 12.04+, Fedora 17+, Arch Linux, Suse,... Mega library for building your own tools is now available! Manual pages for the tools are included in the packages. On Linux you can access them as usual, via 'man megatools'. You can also view the online manual pages. For the most bleeding edge version of megatools with all the latest features and bugfixes see the experimental directory. Static builds for Windows and various Linux architectures are provided. You can also use Chocolatey to install megatools on Windows thanks to ERap320. To install megatools on Arch Linux you can use yaourt. Megatools can be found in AUR. Thanks to Alberto Garcia, megatools was accepted into debian unstable, so you can use apt-get to install it easily. Project status: megatools are maintained. You can join development of megatools simply by sending questions, ideas, bugreports and patches to the above mailing address. GIT repository is available at: https://megous.com/git/megatools.